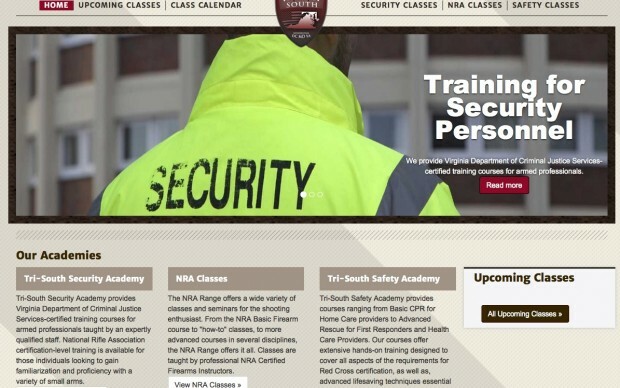 Tri-South Security Academy provides Virginia Department of Criminal Justice Services-certified training courses for armed professionals taught by an expertly qualified staff. National Rifle Association certification-level training is available for those individuals looking to gain familiarization and proficiency with a variety of small arms. Tri-South Safety Academy provides courses ranging from Basic CPR for Home Care providers to Advanced Rescue for First Responders and Health Care Providers. Our courses offer extensive hands-on training designed to cover all aspects of the requirements for Red Cross certification, as well as, advanced lifesaving techniques essential for expert qualification. Tri-South, Inc. provides training to security personnel, safety professionals and firearm enthusiast. We are using Event Espresso to manage the course catalog, event ticketing, and class registration. I have customized a few items to make the site and plugin a seamless integration. The client is very pleased!